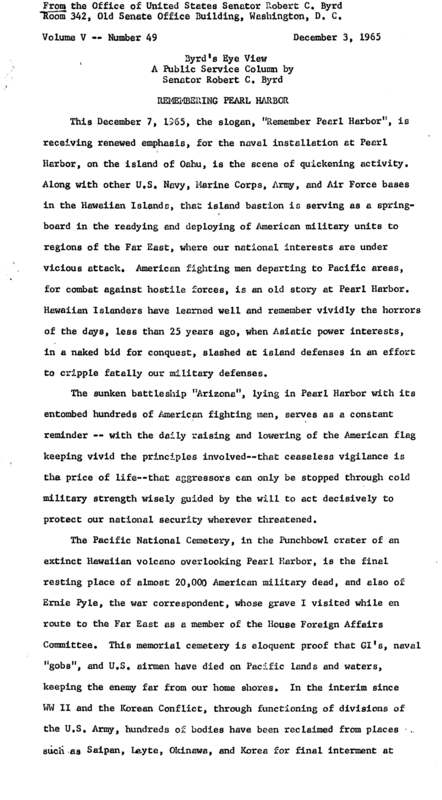 On December 3, 1965, Senator Byrd used his weekly "Byrd's Eye View" column to speak to the threat posed to the United States by a communist take-over of Korea and Vietnam as he reflected on the anniversary of the Japanese attack on Pearl Harbor. In this short discourse, Senator Byrd urges against the protesters opposing U.S. military activity in Vietnam. Robert C. Byrd. "Casualty List from Viet Nam Mounts." Robert C. Byrd Congressional Papers. Accessed 21 April 2019. http://acsc.lib.udel.edu/items/show/310.